We are on our second trip of 2018. For our first trip, we went to a nice hot spring in central California, and then camped through the Sierra Nevada Mountains for awhile. Now we are half way through a trip through California, Oregon, Washington, Idaho, Montana, Utah, Nevada, and back to California. We are also going to Pismo Beach and San Diego two weeks after we get back from this trip. I had never seen a truck camper up close until my neighbor took me over to see the one with a Stable-Lift system already installed. I didn’t know how truck campers loaded and unloaded, so he had me load the camper in my truck to show me. I pushed the three buttons on the system, backed the truck under the camper, and set the camper down in the bed. It took three whole minutes. Then I drove the rig around the block, parked back where I started, pushed the three buttons on the Stable-Lift system, drove the truck out from under the camper, dropped the camper to the ground, and leveled it. That was another three minutes. When I saw how easy loading and unloading the camper was with the Stable Lift system, I had to buy the camper. Loading and unloading was so easy. When loading, I don’t have to be completely lined up. I just need to get the camper between the wheel wells and back in. If the camper is off to one side, I will lower that side first while pulling the camper towards me. There is about one to two-inches of play. It is so weird to be able to move it around by hand like it doesn’t weigh 5,000 pounds. 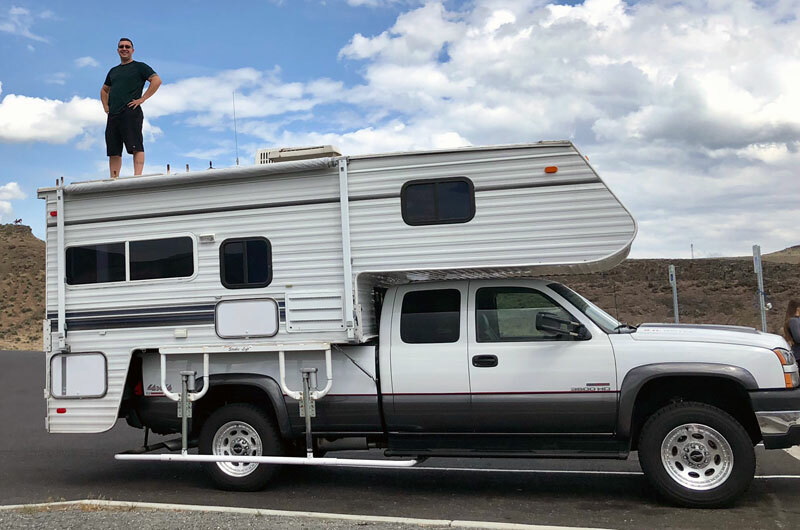 If the camper is not square, I just leave it about an inch up from the bed and re-align the truck. There is no need to remove it and start over because it will move around until it is where you want it. I have loading down now and can get it on the first try. The hardest part of the whole event is going inside to plug the camper into the truck. The Stable-Lift system raises a lot faster if the camper is plugged in because the jacks draw a lot of power when using all three at one time. 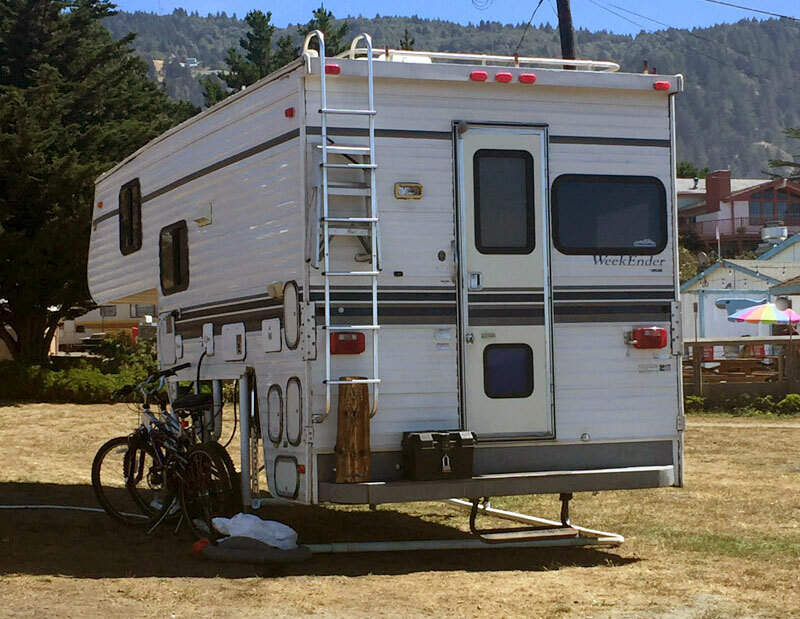 If you are just using the camper’s battery it, takes about 30-percent longer to raise. If we are just staying somewhere overnight and leaving early, I just park and lower the bottom frame of the Stable-Lift system until the camper is level and my suspension is relaxed. This keeps the camper very stable. If we are going to stay anywhere more than one night, I will unload the camper and lower it to the ground. At home I have a really sloped driveway and I like to keep the camper level. When I wash the camper, I like to angle the camper so the water runs off the roof fast. I have been able to level the camper on uneven ground with up to 10-inch of slope. There were two level bubbles at the corner of the camper above the Stable-Lift buttons. All I have to do is use the three buttons to get the bubbles centered and I’m done. On balance, the Stable-Lift system is heavy. It adds 425 pounds to the weight of the camper. Also, if I don’t engage the Stable-Lift stabilizers, the camper sways a lot off the truck. Once you engage the stabilizers, the camper is rock solid. I will never own another camper without a Stable-Lift. In August, we are going to go through all the southern states to Orlando, Florida. My wife wants to ride the zip line roller coaster at Forever Florida. After Orlando, we are going to camp up the East Coast to New York and camp through the northern states on our way back to Napa, California.